Spotify is now enabling independent artists to upload their own music to the streaming service. This will allow indie artists 7 Websites to Discover New Music by Indie Artists 7 Websites to Discover New Music by Indie Artists If mainstream music doesn't appeal, you should check out indie artists online. Here are seven websites to help you discover new music by indie artists from around the world. Read More to take control of the process for themselves, with no need to go through a label or pay to use a third-party service. While most of us exclusively use Spotify to stream music, artists use Spotify in a different way. With the exception of Taylor Swift and a few others, artists want their music on the platform so that they can make money every time someone plays one of their songs. This is why Spotify for Artists exists, as it enables the streaming music service to deal with artists directly. And while the popular artists have record labels doing the donkey work, independent artists are expected to do everything themselves. Which, thanks to Spotify’s new initiative, even includes uploading their own music. On the Spotify for Artists Blog, the streaming service explains how the option for artists to upload their own music has been the most requested feature. 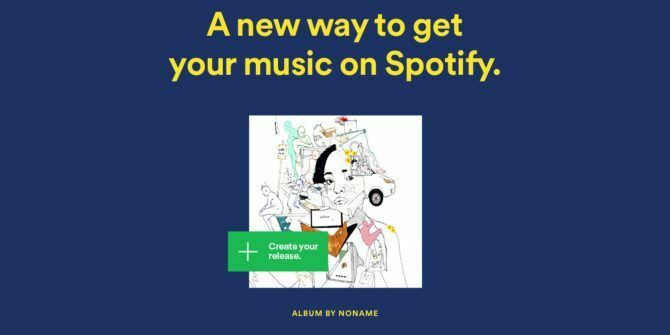 So, in collaboration with a handful of artists and labels, Spotify has developed the necessary tools. The option to upload your own music is currently in betam and therefore limited to a few hundred U.S. artists. These include Noname, Michael Brun, VIAA, and Hot Shade. However, Spotify promises to expand the invite to more artists and labels in the future. This means that, if you yourself are an indie artists looking to start streaming, you could one day have your music available to play on Spotify. The music streaming service suggests interested parties join the Spotify for Artists mailing list. This is a win-win for all concerned. Spotify gets more music on its service, and with minimal effort on its part, and the indie artists get a new platform to build a following, and the potential to make some money in the process. If you’re not an ambitious indie artist, and just want to stream music all day, every day, check out our unofficial guide to Spotify Spotify Music Streaming: The Unofficial Guide Spotify Music Streaming: The Unofficial Guide Spotify is the biggest music streaming service around. If you're not sure how to use it, this guide will walk you through the service, as well as offer some crucial top tips. Read More . Explore more about: Indie Music, Spotify, Streaming Music.